Minimalism describes movements in various forms of art and design, especially visual art and music, where the work is set out to expose the essence or identity of a subject through eliminating all non-essential forms, features or concepts. Minimalism is any design or style in which the simplest and fewest elements are used to create the maximum effect (definition in Wikipedia). I design some of my jewelries using the minimalist concept where all non-essential features are eliminated. And with the simplest elements behind, they have to work harder and work smarter, so that maximum effect can be felt by my customers. In everyday life, when we meet someone for the first time, we usually speak more slowly in a more articulate manner. We use simpler words and phrases. We try to express ourselves with more complete sentences. We employ less technical words or phrases belonging to our respective sub-cultures or idiosyncrasies. In short, we won't act as minimalists. In being limiting to the absolutely essentials, the power of communicability drops below a certain threshold. Minimalist jewelry is however not the same as simple jewelry like a simple (may be very expensive) brilliant cut diamond set with four simple prongs. No extra message is being communicated by a piece of simple jewelry, except the core message "I'm wearing a diamond ring". Minimalism has to create the maximum effect, a special impact, to someone with a shared culture or at least a shared aesthetics, however simple it is being defined. Germany has a strong culture of minimalist jewelry with strong lines, angles and curves signifying a personality in love with precision, rationality and tradition. And it goes beyond jewelry design to German stone cutting of faceted colored stones, their skills still remain world number one, but too expensive to be worked only on the most exquisite stones. Women who do not share this culture find it difficult to appreciate German minimalist jewelries. The minimalism of my jewelries share the same aesthetics with discerning ladies who love the beauty of details, who love the softness of curves rather than the geometric precision of sharp turns and angels, and who love their passion to be expressed maximally in a most subtle way. 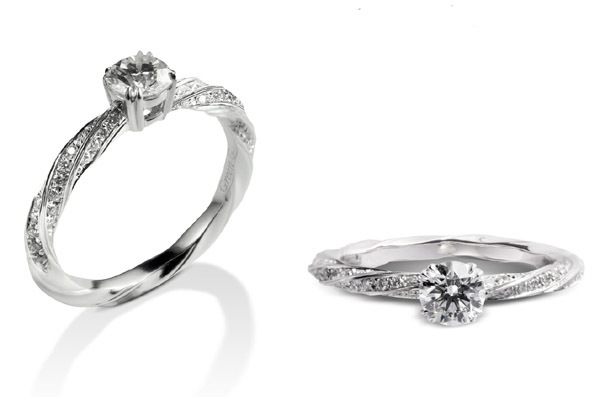 My minimalism is expressed in my Love Tree ring (click HERE for a previous post for details), and my minimalism is likewise expressed in the diamond ring below with four sets of signature petite double prongs, from my "Because of You" collection.